In previous lab we have learnt how to configure OSPF clear text authentication,and now in this lab we will learn how to configure OSPF MD5 authentication which more secure than clear text authentication.Configuring OSPF MD5 authentication is very similar to configuring clear-text authentication. Note:While configuring OSPF MD5 authentication,you must keep two things in mind which i have mentioned below. TIP – OSPF authentication type can also be enabled on an area basis, instead of configuring OSPF authentication type per interface basis. 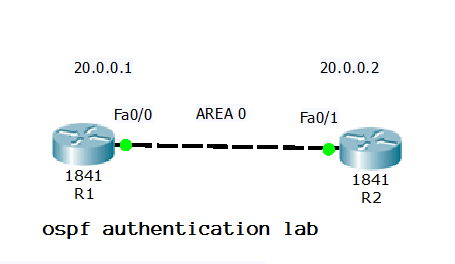 This is done by using the area AREA_ID authentication [message-digest] command under the OSPF configuration mode. If you omit the message-digest keyword, a clear-text authentication will be used for that area.